Friday 31st October 2014 – 12.45pm – Chris Kowalik. A village shop in Shropshire has become the latest public place in the county to be kitted out with emergency lifesaving equipment. Having a defibrillator in Alveley was the dream of the village’s Patient Group in conjunction with local GPs. The dream became reality through fundraising and donations. 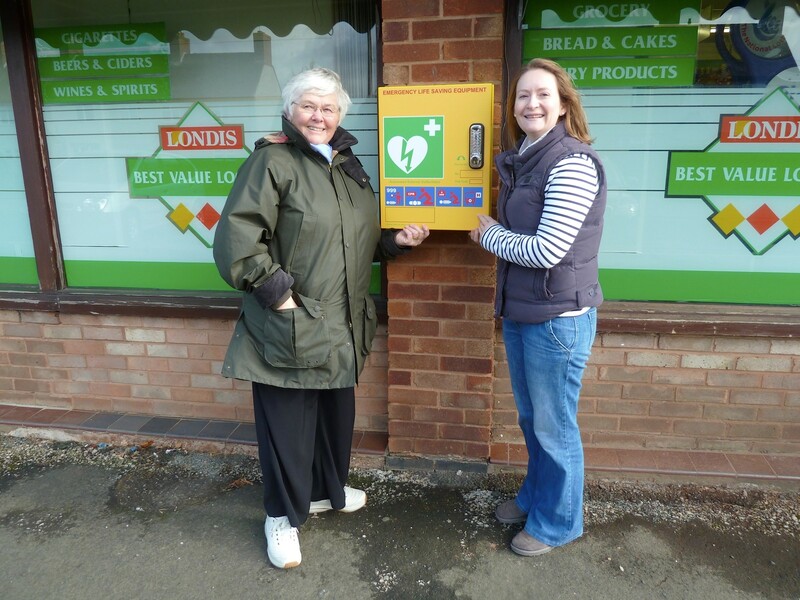 The defibrillator is now housed outside the village’s Londis store. 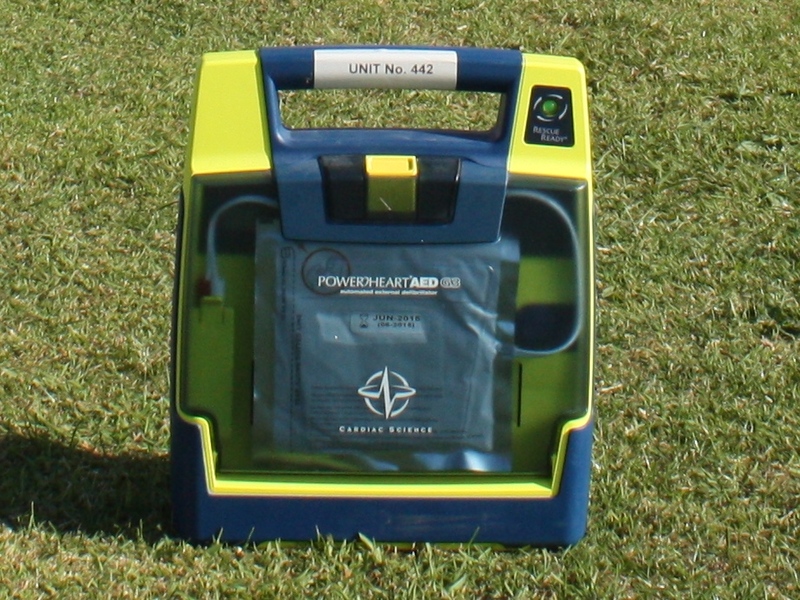 A second defibrillator has also been secured and is due to be housed in the old chapel in the New Year, meaning there will be a defibrillator on either side of the village. 22 people have so far been trained by West Midlands Ambulance Service in its use and in the delivery of CPR. More training sessions are to be arranged. Pictured left to right: Barbara Smart (Chairwoman of Alveley Patient Group) and Aimee Yarrington (Paramedic, West Midlands Ambulance Service). Friday 31st October 2014 – 8.30am – Suzie Wheaton. A road traffic collision in Walsall last night left six people requiring emergency medical treatment from ambulance crews. West Midlands Ambulance Service received a call to Lichfield Road in Shelfield at approximately 10.20pm yesterday evening. Four ambulances, a paramedic area support officer, a BASICS Doctor and a community first responder attended the scene. The police and fire service were also in attendance. A West Midlands Ambulance Service spokeswoman said: “Crews were call to reports of three cars that had been in collision. “One of the vehicles, which had been carrying two occupants, had sustained significant damage. The driver, a man believed to be in his 50’s, was found to be trapped in the vehicle. The man, who was immobilised and extricated from the car, was treated for a suspected fractured pelvis before being conveyed under alert to the major trauma centre at Queen Elizabeth Hospital Birmingham. “The passenger of the car, a man believed to be in his late 40’s, was treated at the scene for a head injury. He was immobilised and conveyed to Walsall Manor Hospital for further assessment. “A second car was carrying two men and a woman all believed to be in their 20’s. The driver, a man, sustained a fractured arm. He was given pain relief at the scene and immobilised before being conveyed to Walsall Manor Hospital. “The second man was assessed at the scene but did not require any further hospital treatment. “The woman, who was suffering from head pain was also assessed at the scene and taken to Walsall Manor Hospital, as a precaution. Thursday 30th October 2014 – 9.00pm – John Hawker. 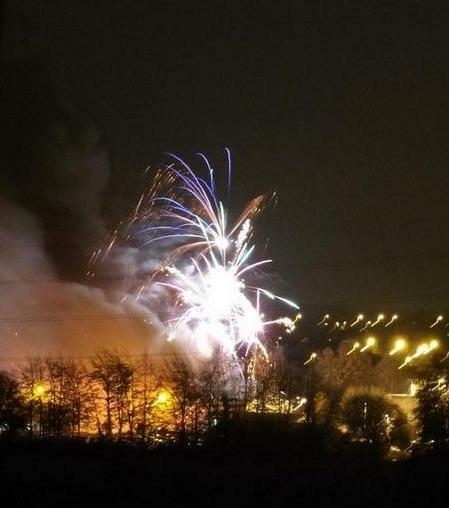 Emergency services are currently dealing with a large fire following an explosion at a fireworks factory earlier this evening. Police, Fire and Ambulance services were called by members of the public across the Stafford area reporting a large explosion and smoke from the large factory unit on Baswich Industrial Estate. Baswich Lane remains completely closed and a large cordon surrounds the location to protect the scene and to allow the emergency services to tackle the fire. 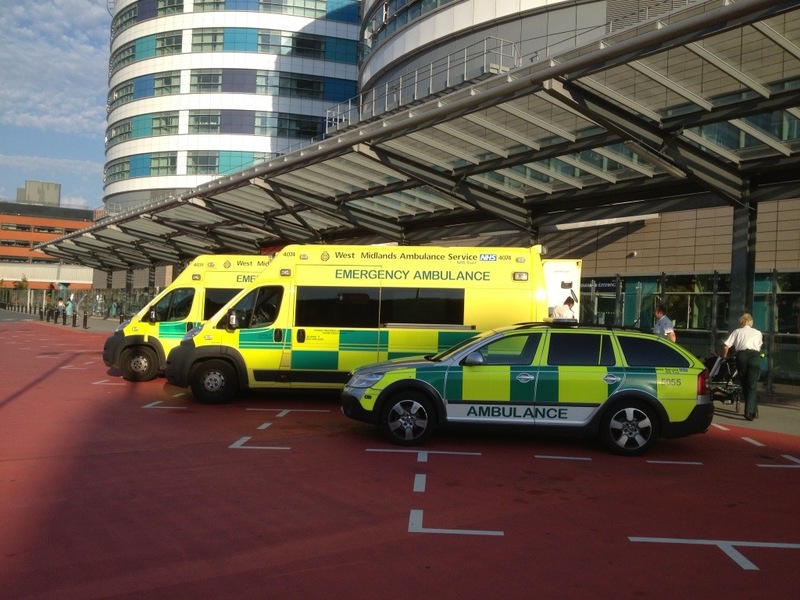 West Midlands Ambulance Service have taken two men to the University Hospital of North Staffordshire. One, who is in his 60s has a back injury and was suffering from smoke inhalation. The other is a man in his 40s with serious burns. Two women, one in her 40s, the other in her 50s were assessed for smoke inhalation and discharged at scene. Staffordshire Fire and Rescue have brought the fire under control and are working to extinguish it as quickly as possible. The building is still alight and has sustained significant damage. Supt Jane Hewett from Staffordshire Police said “At this stage police and fire are working to establish the cause of the explosion, sadly we currently believe one person remains unaccounted for and police are working to support their family. We are currently arranging for a search of the scene tomorrow morning once the fire has been extinguished and the scene made safe. Thursday 30th October 2014 – 8.20pm – Suzie Wheaton. Following on from the early update West Midlands Ambulance Service can now clarify that four patients have been treated following an incident at a fireworks factory on Tilcon Avenue. One man was treated for serious burn injuries before being taken to University Hospital of North Staffordshire. A second man was treated for smoke inhalation and a back injury and was conveyed to the same hospital for further assessment and treatment. Two women were treated for smoke inhalation and were discharged at the scene. A number of ambulance resources remain on scene. Thursday 30th October 2014 – 6.46pm – Murray MacGregor. Ambulance crews have been treating a number of patients after a large fire at a fireworks factory in Stafford. West Midlands Ambulance Service was called to the premises at Tilcon Avenue at 5.15pm. A large number of ambulance resources have been sent to the scene including four ambulances, the Hazardous Area Response Team, four emergency doctors, five paramedic officers and two rapid response vehicles. • Two patients are being taken to the major trauma centre at University Hospital North Staffordshire. One has burns, the other has smoke inhalation. • Two further patients have been discharged on scene. • A further patient has minor injuries. 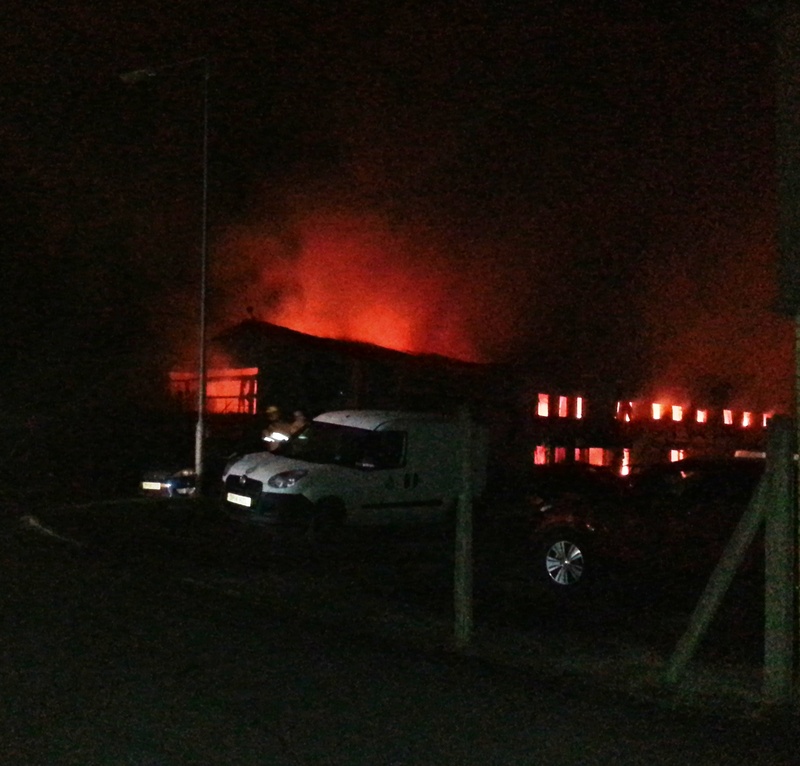 West Midlands Ambulance Service is at the scene of a fire in a fireworks factory in Stafford. Two patients so far. Further details to follow. Do you know how to treat a burn? Watch a paramedic show you how. Education and Training Officer Krystle O’Brien explains what you should do if you suffer a significant burn. Thursday 30th October – 11am – John Hawker. West Midlands Ambulance Service is urging the public to stay safe this bonfire night and have fun instead of a lifetime of suffering. It should be a time of excitement for all, but fireworks and bonfires result in serious life changing injuries for some people each year. 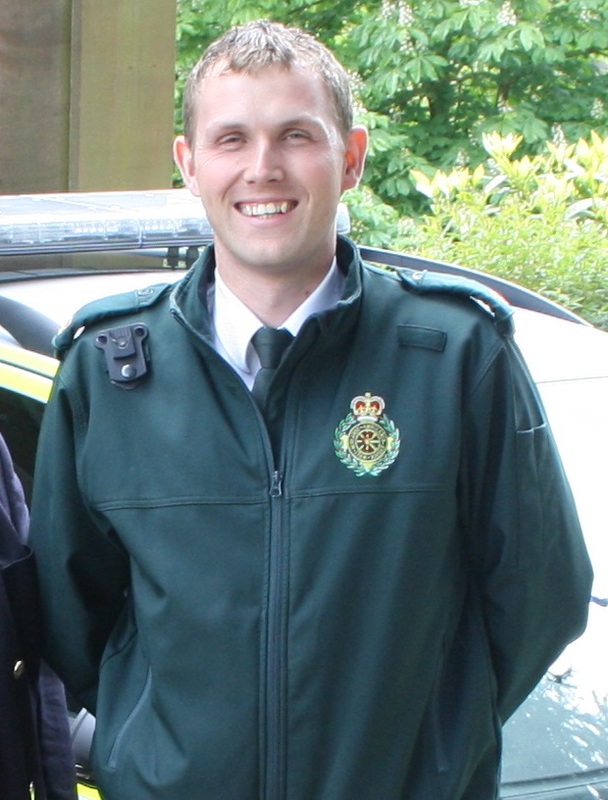 WMAS Area Manager, Martyn Scott, said: “These injuries will remain with that person for the rest of their life, and in most cases we know that they could have so easily been avoided. It appears that people don’t realise they are holding an explosive device in their hands when they light a firework; it is always alarming when people are surprised that they get injured. “Last year crews dealt with numerous incidents including hand injuries caused to people who were holding fireworks when they exploded, burns from bonfires after simple slips and trips, to the more extreme cases where members of the public used petrol or other accelerants on bonfires; resulting in the fire flashing back and causing serious burns, which can and will scar for life. “Unfortunately despite the many warnings issued at this time of year our crews are sadly all too familiar with people who have injured themselves in firework incidents. I am in no doubt that there are people sat at home today still suffering the effects of burn injuries or having lost their fingers after accidents last year. Paramedic and training officer, Krystle O’Brien, said: “We understand that accidents occur, but we would prefer people to try and prevent accidents rather than put themselves in danger with irresponsible actions. If someone does suffer a serious burn injury from fireworks or a bonfire, the best course of action is to get the area of the burn under some cold running water as soon as possible. If the burn or injury is too severe for the patient to be taken to hospital with a cold compress in place then call 999. However, please remember that 999 calls are prioritised by severity and all life threatening calls will take priority. West Midlands Ambulance Service would like everyone to enjoy the forthcoming weekends and to stay safe; why not think about attending an organised firework display where possible? If you are planning on holding a party at home, please ensure you do so safely and follow the Firework Code* at all times. •	Don’t drink alcohol if setting off fireworks. •	Keep fireworks in a closed box. •	Follow the instructions on each firework. •	Light at arm’s length, using a taper. •	Never go near a firework that has been lit. Even if it hasn’t gone off, it could still explode. •	Never put fireworks in your pocket or throw them. •	Always supervise children around fireworks. •	Light sparklers one at a time and wear gloves. •	Never give sparklers to a child under five. Wednesday 30th October 2014 – 9.40am – Chris Kowalik. 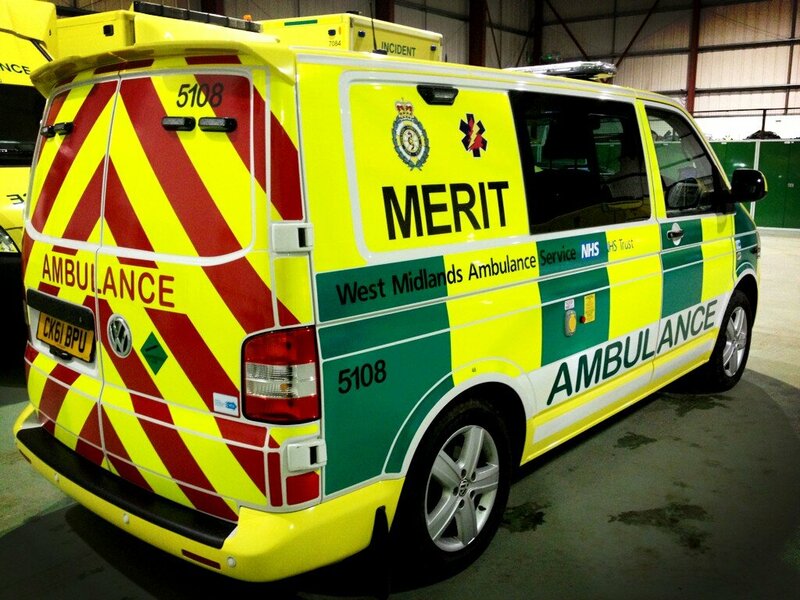 A woman pedestrian has been badly injured in a road traffic collision in the Black Country. West Midlands Ambulance Service was called to Temple Street, Lower Gornal, shortly after 7.15am today. Two ambulance crews, a paramedic in a rapid response vehicle, a paramedic area support officer in a rapid response vehicle and the MERIT trauma team consisting of a trauma doctor and critical care practitioner attended. A West Midlands Ambulance Service spokesman said: “The woman, a pedestrian in her sixties, had serious leg injuries. “Crews used tourniquets and splints, administered pain relief and immobilised her on a scoop stretcher. 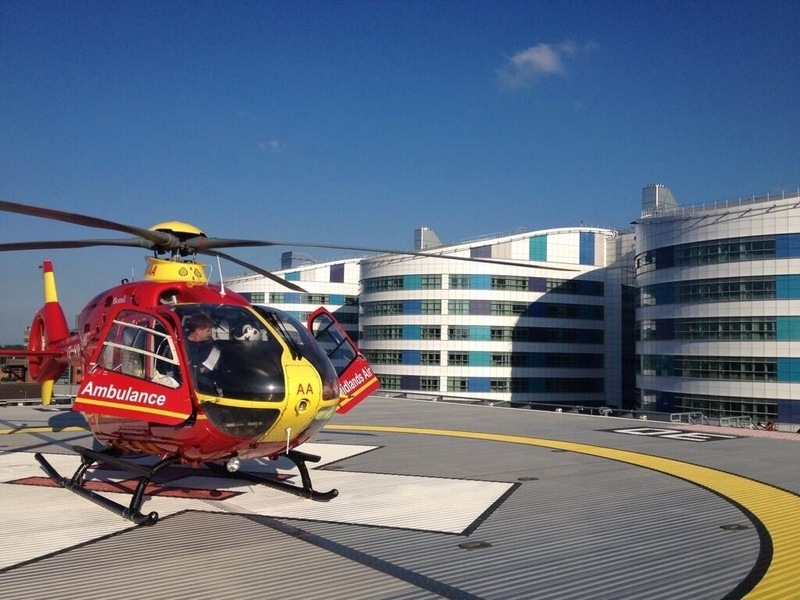 Accompanied by the MERIT team, she was taken to the major trauma centre at Queen Elizabeth Hospital Birmingham. Thursday 30th October 2014 – 6.40am – Suzie Wheaton. 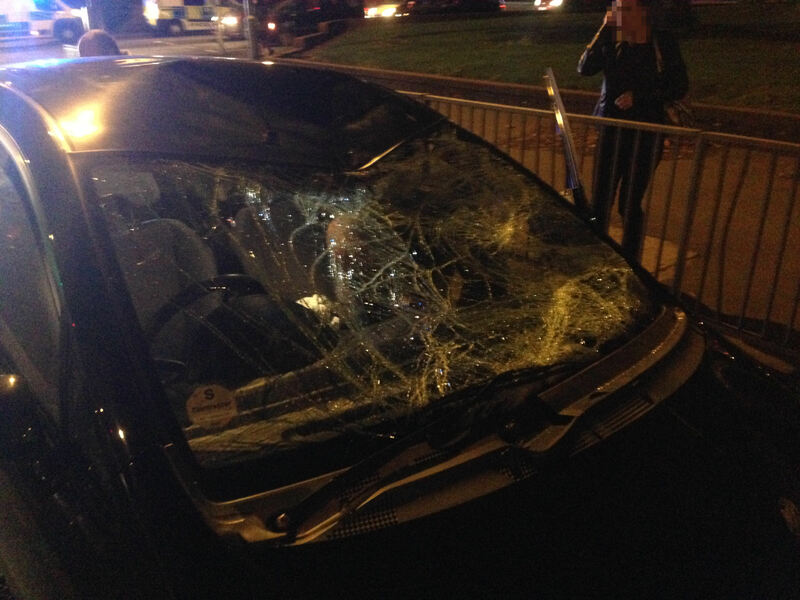 A young man has been treated for injuries after being in collision with a car in Birmingham last night. West Midlands Ambulance Service was called to reports of a pedestrian that had been in collision with a car outside the University on the Bristol Road in Selly Oak shortly after 11.45pm yesterday evening. An ambulance, a rapid response vehicle, a paramedic area support officer and the Trust’s MERIT rapid response vehicle, carrying a trauma doctor and a critical care paramedic, were dispatched to the scene. Wednesday 29th October 2014 – 9.00pm – Suzie Wheaton. Two pedestrians sustained serious injuries following a road traffic collision in Sutton Coldfield today. West Midlands Ambulance Service dispatched two ambulances, three rapid response vehicles, a paramedic area support officer and a BASICS doctor to the incident on the Birmingham Road in Wylde Green at approximately 6.05pm this evening. A West Midlands Ambulance Service spokeswoman said: “On arrival at the scene crews found two pedestrians who had been injured following a collision with a car. The car was found to have sustained significant damage to its windscreen. “The first pedestrian, a woman, had suffered a serious head injury and had a reduced level on consciousness. 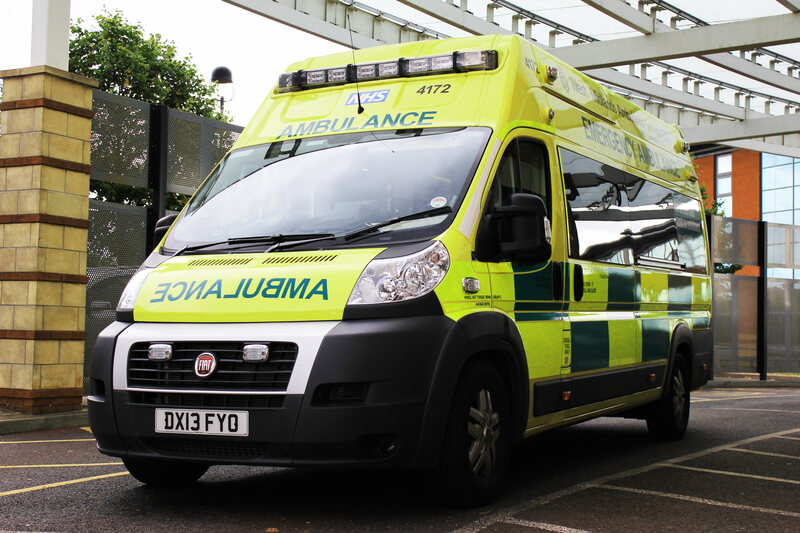 Crews provided emergency medical treatment to the woman at the scene before she was conveyed to the major trauma centre at Queen Elizabeth Hospital in Birmingham. “The second pedestrian, an elderly man, was treated at the scene for a suspected pelvic fracture and a potential head injury. He was immobilised and conveyed to the same hospital for further assessment and treatment. Wednesday 29th October 2014 – 5.00pm – John Hawker. Four people have been injured following a crash on the M6 this afternoon. The crash occurred between Keele Services and Junction 15, Southbound at around 3.10pm. Two ambulances, a rapid response vehicle, two paramedic officers and a BASICS Doctor attended the scene. A West Midlands Ambulance Service spokesman said: “Crews arrived to find a lorry and car that had been in a serious crash. 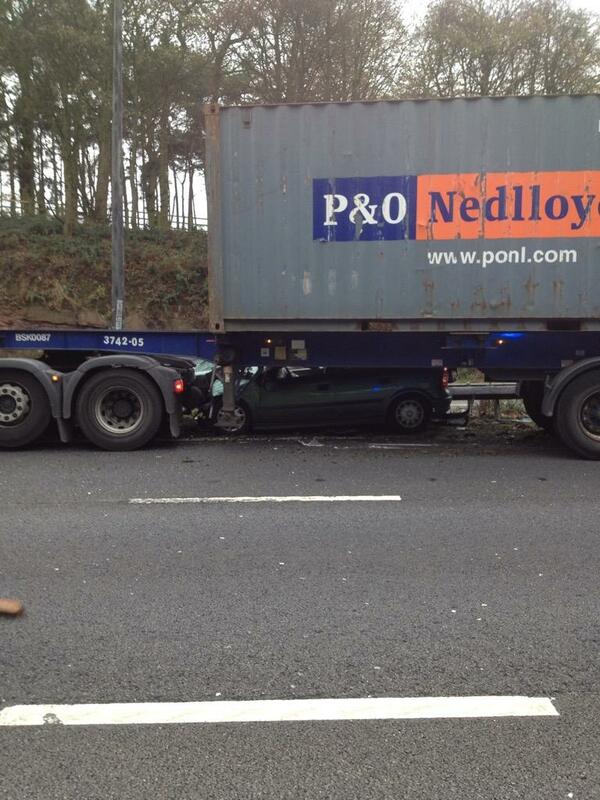 The car was pinned against the central reservation and partly underneath the HGV. “The four occupants of the car managed to get out of the vehicle and had suffered numerous injuries. The man driving suffered chest injuries, the woman passenger suffered pelvic, arm and chest injuries. Both were believed to be in their late 30’s or early 40’s. “The two girls travelling in the back of the car were treated for facial injuries and multiple minor injuries. Both were believed to be between 8 and 10 years old. “All four patients received emergency treatment at the scene and were transferred to University Hospital North Staffordshire for further emergency treatment. The doctor travelled on board the ambulance with the woman patient due to her injuries. “The lorry driver was uninjured in the crash. Wednesday 29th October 2014 – 10.45am – Murray MacGregor. For six members of staff from West Midlands Ambulance Service, their jobs are really set to take off for the next three years. They have just qualified as aircrew paramedics who will fly on the Midlands Air Ambulance aircraft based in Staffordshire and Worcestershire. Although flying from Tattenhill and Strensham, their role could, and almost certainly will take them almost anywhere in the West Midlands or even further afield. The six were picked from the many staff who applied for the role. 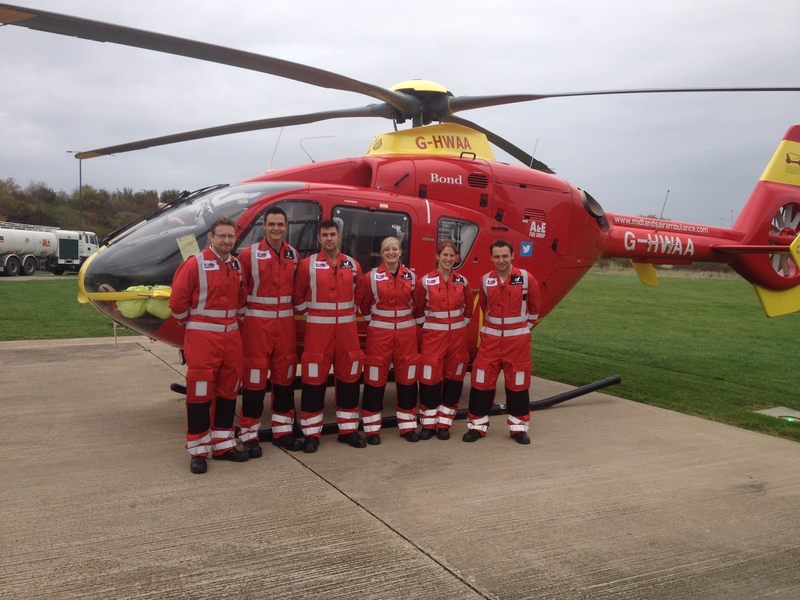 They finished a two week HEMS (helicopter emergency medical service) technical crew member training course last week. During the course, which took place at new education visitor centre at Strensham Airbase just off the M5 motorway, each of them had to get to grips with navigation; meteorology; safety around the aircraft; basic airmanship; and getting familiar with the equipment used on the aircraft which is smaller and a very different environment to use in. 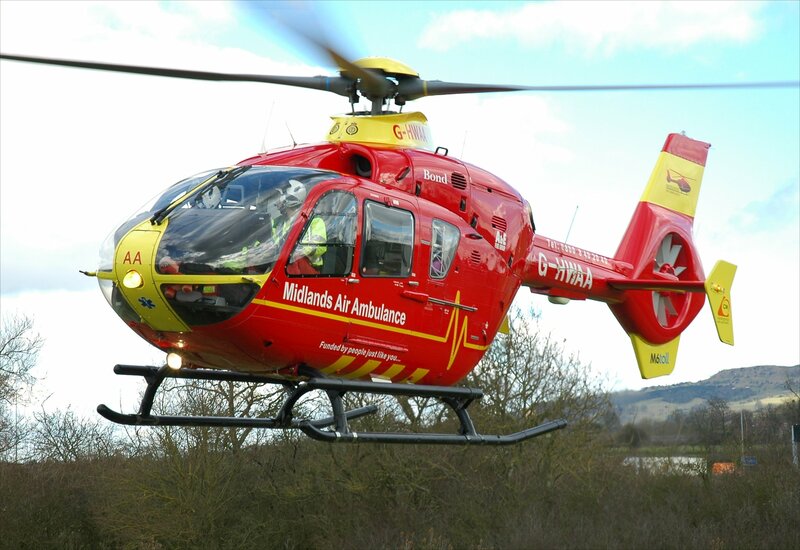 WMAS Air Operations Manager, Becky Tinsley, said: “Each of the six will be seconded for three years to work part time on the Midlands Air Ambulance aircraft based at Strensham and Tattenhill. The rest of the time they will continue in their main roles. • Final assessment – this is where they have to put all of their learning into practice and is a pass/fail test. Assistant Chief Ambulance Officer, Steve Wheaton, who himself used to be an aircrew paramedic, added: “Congratulations to each of them on getting through the selection and training programmes, which is no easy task. From left: Mike Smyth (Clinical Department at HQ), Steve Mason (Warwick), Dave Bentley (HART in Oldbury), Kelly Bennett (Erdington, Birmingham), Laura Rogers (HART) and Pete Edwards (Willenhall, Black Country). Wednesday 29th October 2014 – 8.30am – Suzie Wheaton. 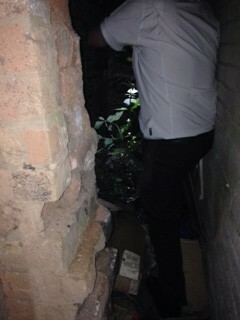 Ambulance crews had to search for a man for over an hour, after he became trapped and injured in a small passage way in Birmingham in the early hours of this morning. West Midlands Ambulance Service received a call from a man at 3.46am this morning stating that he had fallen approximately 10 metres into a ditch and had no idea where he was. The man was believed to have been on Holloway Circus but didn’t know in which direction he had been walking. A West Midlands Ambulance Service spokeswoman said: “Staff within the emergency control room tried to establish as much information as they could to enable the crews to get as close the patient’s location as possible. “On arrival at the location, the ambulance crew and paramedic area support officer couldn’t locate the man. The crew contacted the patient directly, via his mobile phone, and talked him through his journey. By using the lights and sirens of the vehicle, which enabled the patient to detect when they were close by, the man was finally discovered after an hour of searching. “The man who had become trapped between a high wall and a Church, off Windmill Street, was treated at the scene for a minor leg injury and removed from the passageway. Tuesday 28th October 2014 – 8.30pm – Suzie Wheaton. Six people received emergency medical treatment following a road traffic collision in Shropshire today. West Midlands Ambulance Service was called to a serious collision on the A41 in Ashford, Market Drayton shortly after 4.20pm this afternoon. Six ambulances, a rapid response vehicle, a paramedic area support officer and a rapid response vehicle from the Midlands Air Ambulance base in Cosford, carrying a trauma doctor and a critical care paramedic, were dispatched to the scene. A West Midlands Ambulance Service spokeswoman said: “Crews were called to a serious road traffic collision between a car and a van. Six people were found to have been injured in the collision, which left the road blocked for a period of time. “Three people from the car were treated at the scene. The two passengers from the vehicle had to be extricated, with the assistance of the fire service. The front seat passenger, a woman believed to be in her 40’s, was treated for multiple injuries. She was fully immobilised and given pain relief before being taken to University Hospital of North Staffordshire. “The rear seat passenger, a teenage girl, was treated for back and chest injuries. She was also immobilised and given pain relief and taken to the same hospital under alert for further assessment and treatment. “The driver of the car, a man believed to be in his 40’s, had sustained a back injury. He was immobilised and conveyed to the Royal Shrewsbury Hospital. “The driver of the van, a man in his early 20’s, was treated for leg and potential pelvic injuries. He was fully immobilised and given pain relief at the scene before being conveyed to the major trauma centre of University Hospital of North Staffordshire. Tuesday 28th October 2014 – 5.00pm – John Hawker. 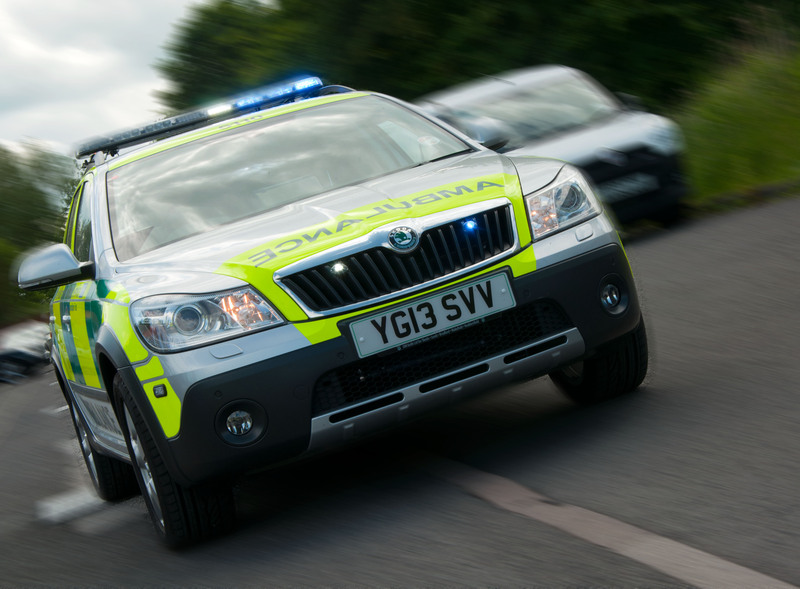 A man has died following an RTC near Atherstone this morning. The crash occurred on the A5 between Atherstone and Merevale at around 10.35am. An ambulance, a rapid response vehicle and a paramedic officer attended the scene. A West Midlands Ambulance Service spokesman said: “Crews arrived to find a motorcycle and a lorry that had been in a collision. “Unfortunately, it quickly became apparent nothing could be done to save the motorcyclist and sadly he was confirmed dead at the scene. Tuesday 28th October 2014 – 10.40am – Murray MacGregor. 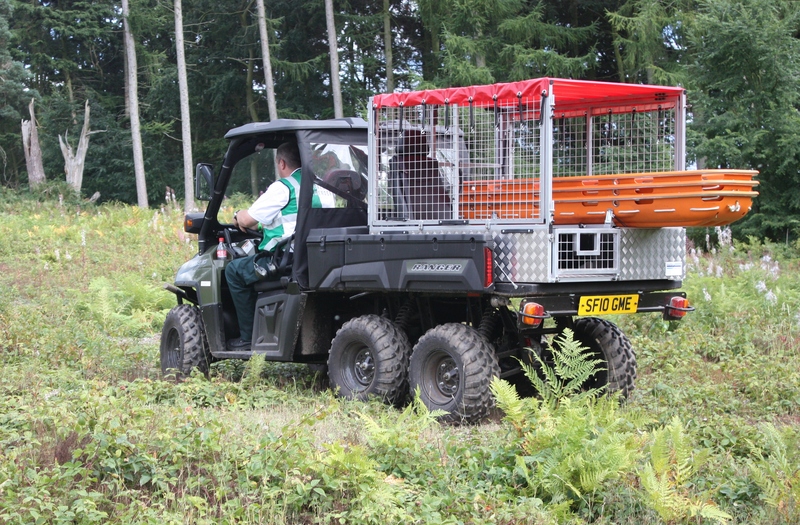 Ambulance staff had to use a specialised six wheel drive vehicle to get a woman back to an ambulance after she fell off a horse. The incident happened about half a mile away from Waystone Lane in Belbroughton at around 3 o’clock on Monday afternoon. An ambulance crew were initially sent to the scene, but after they became concerned their vehicle would get stuck, asked for the assistance from the Hazardous Area Response Team (HART). A West Midlands Ambulance Service spokesman said: “The 45 year old woman had come off her horse down a very narrow, muddy and rutted bridleway. “There was no way the ambulance crew could get anywhere near her in their vehicle despite their efforts. “The woman wasn’t able to fully recall what had happened though the ambulance crew were told that she probably hadn’t been fully unconscious. “While the crew waited for the HART team to bring their Polaris six-wheel-drive vehicle to the scene, they treated the woman for suspected concussion, bruising to her ribs and she was immobilised as a precaution. “Despite the Polaris being a relatively small vehicle, the driver had to reverse it the half mile back to the ambulance as the track was too narrow to turn around. Tuesday 28th October 2014 – 9.05am – Murray MacGregor. 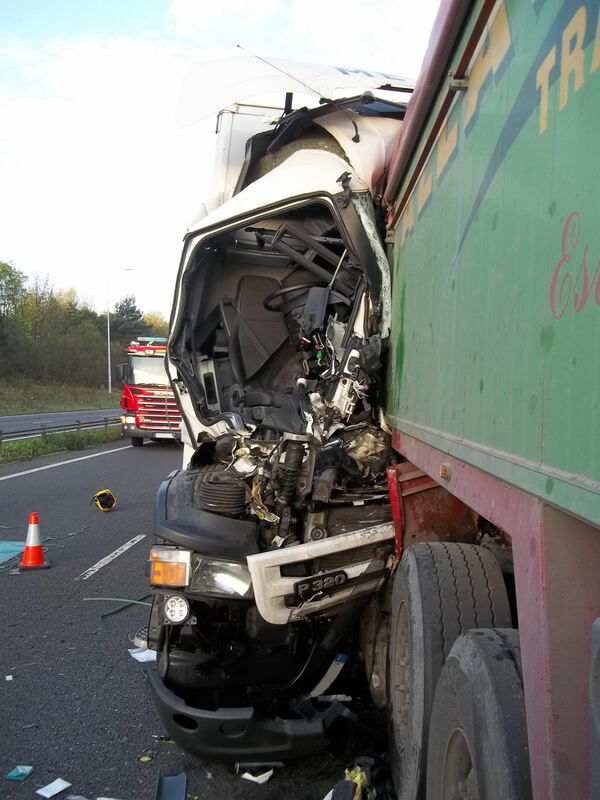 A lorry driver has been airlifted to a major trauma centre after suffering very serious injuries in a crash involving two lorries. The crash happened at just before 6.15am on Tuesday morning on the A50, Uttoxeter bypass close to the Little Chef. A rapid response vehicle, two ambulances, a paramedic officer and a BASICS emergency doctor were sent to the scene. The doctor who was due to work on the Derbyshire, Leicestershire and Rutland Air Ambulance came across the incident and stopped to assist. He then liaised with the aircraft which was flown to the scene. 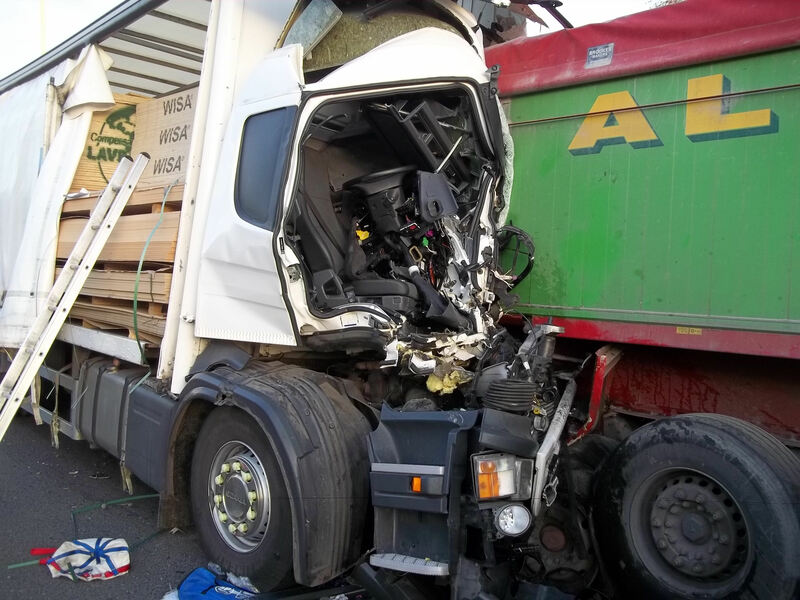 A West Midlands Ambulance Service spokesman said: “On arrival, crews found two lorries had been involved in a significant collision causing considerable damage. “The driver of the rear lorry was trapped for over an hour while fire and ambulance staff worked to free him while treating his injuries. “He had suffered a significant left leg injury. He was given pain relief and was immobilised as he was extracted from the wreckage. “The man, who was in his 20s was airlifted to the major trauma centre at University Hospital North Staffordshire. Tuesday 28th October 2014 – 6.30am – Murray MacGregor. Commuters faced long delays in the middle of Birmingham last night after a three car collision that left one on its roof. The crash happened just off Bristol Street outside the O2 Academy at about 5.25pm on Monday evening. A West Midlands Ambulance Service spokesman said: “When crews arrived they were told that one of the cars had rolled over twice. The man and woman in their 30s who were inside it had managed to get out of the vehicle. Both were complaining of neck and back pain. They were immobilised before being taken to City Hospital for further assessment and treatment. “A woman in her 30s from a second car and a man in his 30’s from the third were both assessed by ambulance staff at the scene but were discharged. Monday 27th October 2014 – 11.10pm – Murray MacGregor. 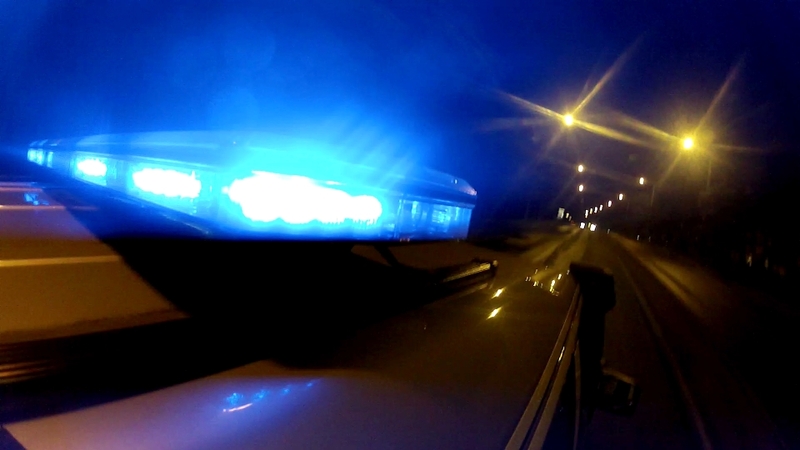 A man has died after an incident on the M6 in Staffordshire. 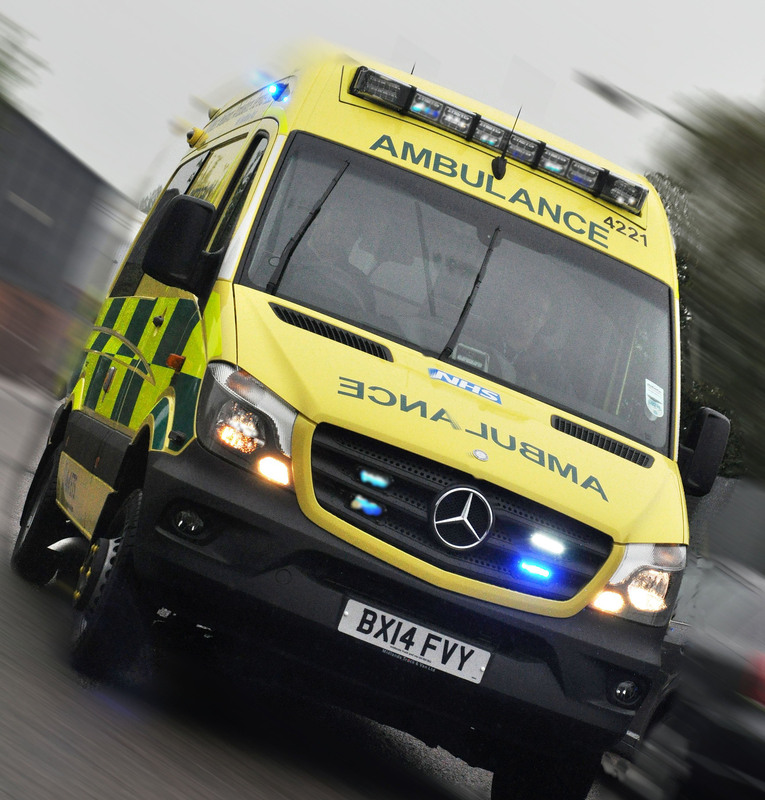 West Midlands Ambulance Service was called to the southbound carriageway just before junction 12 at 7.20pm on Monday evening to reports of a serious road traffic collision. Two ambulances, a BASICS doctor, the MERIT trauma doctor and two paramedic officers were sent to the scene. A West Midlands Ambulance Service spokesman said: “On arrival, ambulance staff found a man who had been in collision with an HGV. Sadly it was immediately obvious that nothing could be done to save him and he was confirmed dead at the scene. The drivers of three HGVs and a van were treated at the scene for shock but were discharged after being assessed. The subsequent investigation meant the M6 was closed by police leading to delays. Monday 27th October 2014 – 10.30pm – Murray MacGregor. A father and his daughter have been taken to separate major trauma centres after they were in collision with a car in Birmingham. They were on a bike when the collision happened on the A45 Coventry Road, Yardley outside the Bill and Bull public house. “Two ambulances, a paramedic officer and the MERIT Trauma doctor were sent to the scene after a number of 999 calls at 7.50pm on Monday evening. A West Midlands Ambulance Service spokesman said: “On arrival, crews found a badly damaged bicycle and a car that had suffered significant damage. “The 3 year old girl had a serious head injury and was not fully conscious. She was taken on blue lights to Birmingham Children’s Hospital, the paediatric major trauma centre for the West Midlands with the doctor travelling with her. “The father, a man in his 30s had suffered serious head and chest injuries and was concussed. He was taken by ambulance on blue lights to the Queen Elizabeth Hospital Birmingham, an adult major trauma centre. The critical care paramedic from the MERIT car travelled with the crew. “Thankfully, although serious injuries, neither is thought to be in a life threatening condition. “The driver of the car, a man in his 30s was badly shaken but uninjured and did not require hospital treatment. Monday 27th October 2014 – 11.30am – Steve Parry. A lorry driver was trapped for over two hours following a collision at Neenton near Bridgnorth earlier this morning. 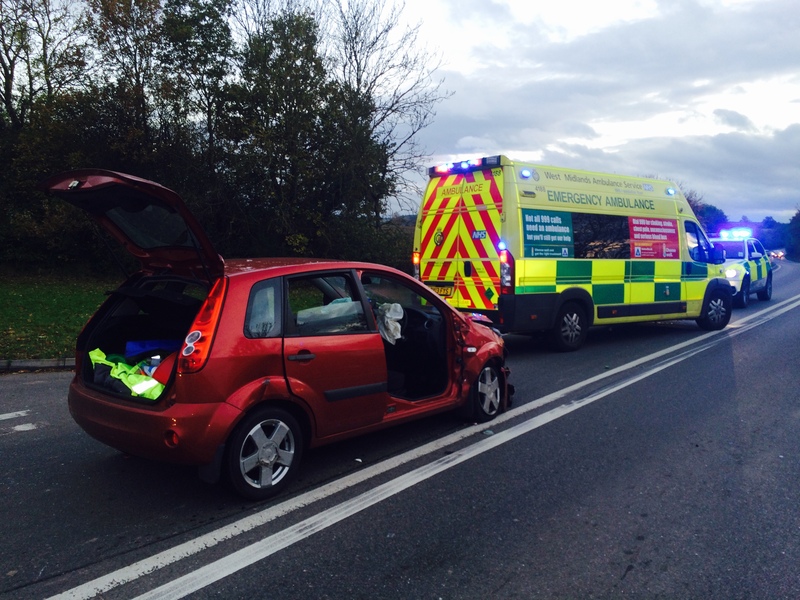 West Midlands Ambulance Service was called to the incident on the B4364 at just after 8.10am. Two ambulances together with a paramedic officer in a rapid response vehicle, a BASICS doctor and Midlands Air Ambulances’ from Cosford and Staffordshire were sent to the scene. A West Midlands Ambulance Service spokesman said: “Crews responded to a road traffic collision involving a light goods lorry and van. It was reported that the lorry then collided with a tree. “The woman driver of the lorry, believed to be in her forties, was trapped in her vehicle for over two hours. She was later released and treated for serious multiple injuries. “Additional blood and medical supplied were delivered to the scene by a second air ambulance as medics worked to stabilise the condition of the trapped patient. “The woman was sedated by a doctor at the scene before being airlifted to the Queen Elizabeth Hospital. The hospital was alerted to the serious condition of the patient. Sunday 26th October 2014 – 8.45pm – John Hawker. A man who was travelling on a motorcycle in a field has suffered serious leg injuries after a crash this afternoon. The crash occurred in a field off Oakfield Road, Wollescote at around 4.30pm. An ambulance and the Trusts Hazardous Area Response Team attended the scene. A West Midlands Ambulance Service spokesman said: “Crews arrived to find a man in his late 20’s who had fallen from a motorcycle. “The man had suffered an open fracture of his leg and received emergency treatment at the scene, including pain relief. “His condition was stabilised and he was transferred by ambulance to Russells Hall Hospital for further emergency treatment. Sunday 26th October 2014 – 9.15am – John Hawker. Four people have been trapped in the truck they were travelling in after a crash in Hereford this morning. The crash occurred on the A411, around two miles outside Kington at around 4.10am. Four ambulances, a paramedic officer, a MARS Doctor, a BASICS Doctor and the Trusts MERIT team were dispatched to the scene. A West Midlands Ambulance Service spokesman said: “Crews arrived to find a 4×4 pick-up truck that is believed to have left the road and hit a tree. It appears the cab of the truck has then become completely detached from the rest of the chassis and come to rest in the road with the occupants trapped inside. 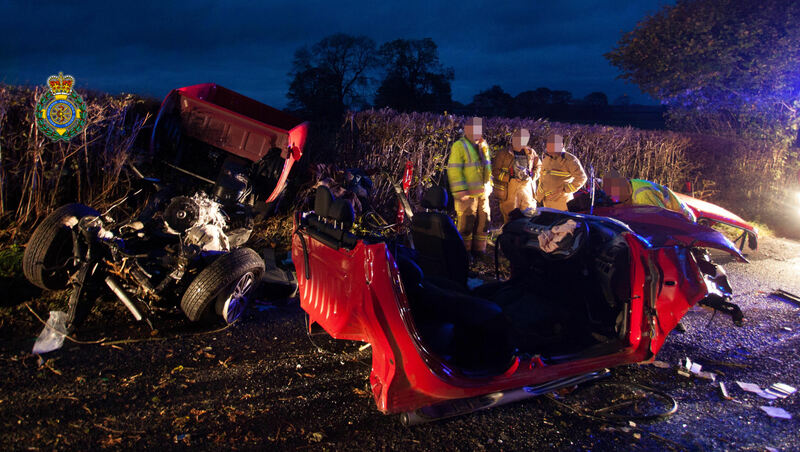 “Four men, all believed to be in their 20’s, suffered injuries in the crash and all received treatment from medics at the scene whilst being extricated. Thankfully, all four men were wearing seatbelts at the time of the crash. “One man suffered serious chest and abdominal injuries, whilst a second man suffered serious abdominal injuries. Both patients received emergency treatment at the scene and were transferred by land ambulances to Queen Elizabeth Hospital Major Trauma Unit for further treatment. They were accompanied by medics to the hospital. “The two other men travelling in the truck suffered chest injuries and leg injuries. Both men received treatment before being transferred to Hereford County Hospital for treatment. Saturday 25th October 2014 – 10.15am – John Hawker. 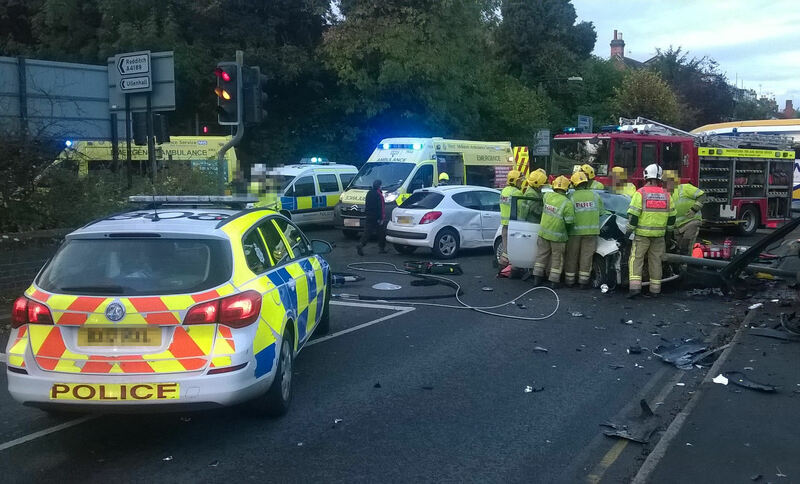 Three people have been injured following a crash in Birmingham this morning. The crash occurred at the junction of Chester Road and Court Lane, Sutton Vesey at around 6.35am. Three ambulances, a paramedic officer and the Trusts MERIT team attended the scene. A West Midlands Ambulance Service spokesman said: “Crews arrived to find two cars with significant damage. “A woman, believed to be in her 60’s was trapped in one car and was treated at the scene for abdominal, back and pelvic injuries. She was trapped for around 40 minutes. The woman was extricated with the assistance of the fire service and her condition was stabilised. She was transferred to Queen Elizabeth Hospital Major Trauma Unit for further emergency treatment. “The man driving the second car, believed to be in his 30’s, was also trapped in his vehicle and was treated at the scene for back and wrist injuries. He was also extricated from the vehicle and transferred to Heartlands hospital for further treatment. “The passenger in the second car, a woman in her 30’s, suffered back pain in the crash and following treatment was also transferred to Heartlands for further treatment. Friday 24th October 2014 – 10.40am – Jamie Arrowsmith. West Midlands Ambulance Service can confirm one of its ambulance vehicles was involved in a collision with a car in Station Road, Yardley shortly after 8.20am this morning. The ambulance was responding with blue lights and sirens to a medical case when it was in collision with a car. A West Midlands Ambulance Service spokesman said: “As a result of the collision, three people required treatment before all being taken to Heartlands Hospital. “One crew member, a man, was treated on scene for a shoulder injury before being taken to hospital. “From the car, two patients had to be cut free with the help of the fire service. “The front seat passenger, a female teenager, was treated by crews for minor chest and leg injuries. Friday 24th October 2014 – 6.10am – Murray MacGregor. A man has suffered critical injuries after a crash between a car and an empty petrol taker left the car sitting on the central reservation of a busy dual carriageway. The collision happened on the northbound A449 Worcester to Kidderminster road near to the Ombersley junction at around 7.50pm on Thursday evening. An off duty BASICS doctor came across the incident and was backed up by an ambulance, a paramedic officer and the MERIT Trauma Doctor. A West Midlands Ambulance Service spokesman said: “On arrival, crews found the car on the central reservation with very significant intrusion into the right hand side of the car. “The car driver, who was thought to be in his 30s, had suffered a very serious head injury. “Ambulance staff worked with firefighters to rapidly extricate the man from the wreckage. He was anaesthetised at the scene before being taken on blue lights to the Major Trauma Centre at the Queen Elizabeth Hospital. Thursday 23rd October 2014 – 11.03pm – Murray MacGregor. A man’s had to be extricated from the wreckage of the car he was driving after a three vehicle collision involving a bus in Warwickshire. The crash happened just before 5.00pm on Thursday afternoon on the Fosse Way close to the Chesterton turn. A West Midlands Ambulance Service spokesman said: “On arrival, ambulance staff found two cars and a small bus had been in collision. “The bus driver, a man in his 40s was assessed at the scene and discharged along with the one male passenger aboard. “The driver of a red car, a man in his 50s was complaining of neck and back injuries. At the request of ambulance staff, firefighters removed the driver’s door so that the man could be extricated from the vehicle safely. “He was immobilised and given pain relief before being taken to Warwick Hospital. Thursday 23rd October 2014 – 10.35pm – Murray MacGregor. Four men have been taken to hospital, two in a potentially serious condition after a collision between a lorry and a single decker bus. Four ambulances and a paramedic officer were sent to the scene after the crash at just after 6.30pm on Thursday evening. An off duty WMAS paramedic and a Welsh Ambulance Service paramedic who were driving by also stopped to assist. “A passenger who was fortunately sitting just in front of the impact point suffered nasty facial injuries. The man, who was estimated to be in his 30s, was immobilised before being taken to Royal Shrewsbury Hospital. “Initial reports suggested an 18 year old man at the rear of the coach had been ejected and had been unconscious for a period. When ambulance crews arrived he was out of the bus but fully conscious. He was suffering from a head abrasion, aches and pains. As a precaution he was also immobilised and taken to the same hospital. “The bus driver, a man in his 30s, was suffering from possible fractured ribs. He was also taken to the Royal Shrewsbury for further assessment and treatment. 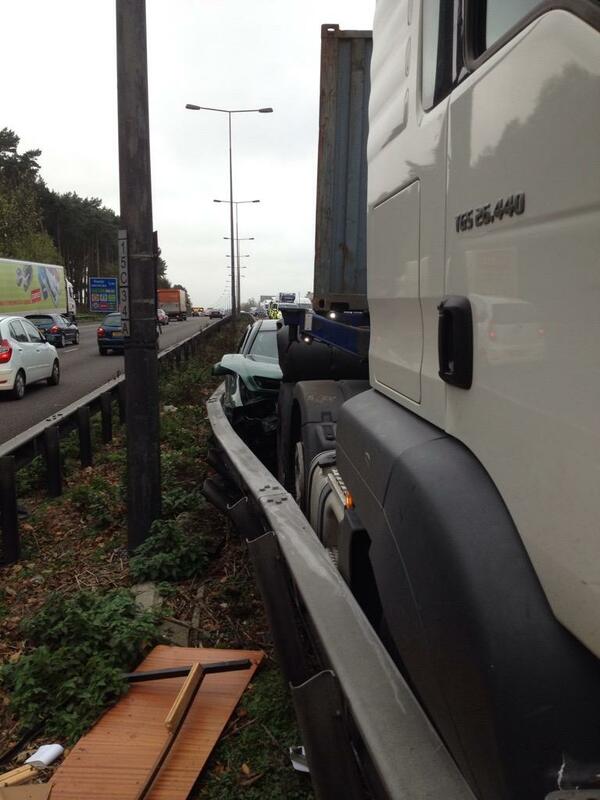 “The lorry driver, who was in his 40s, suffered a lower right leg injury but had managed to get out of his vehicle. After assessment at the scene, he went to the same hospital as the other three. Thursday 23rd October 2014 – 6.00pm – Murray MacGregor. 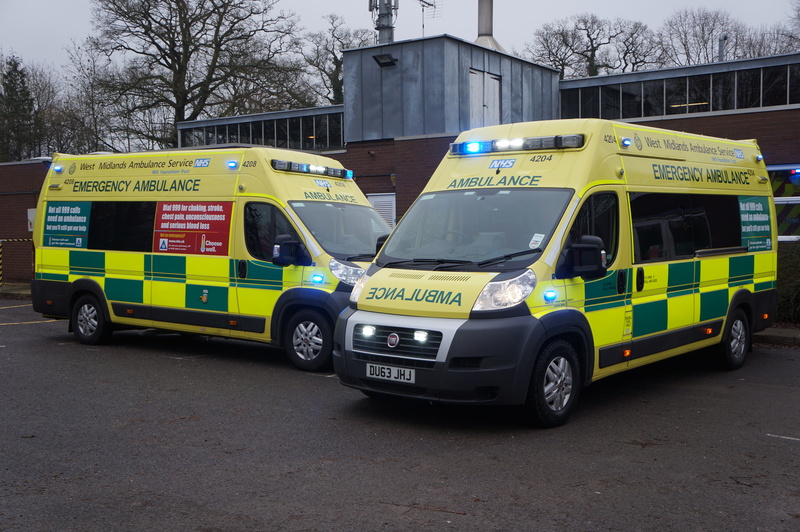 West Midlands Ambulance Service say the NHS England Five Year highlights the vital part that ambulance services can play in the future of the NHS. The plan sets out the challenges that face the health service as it moves towards 2020. 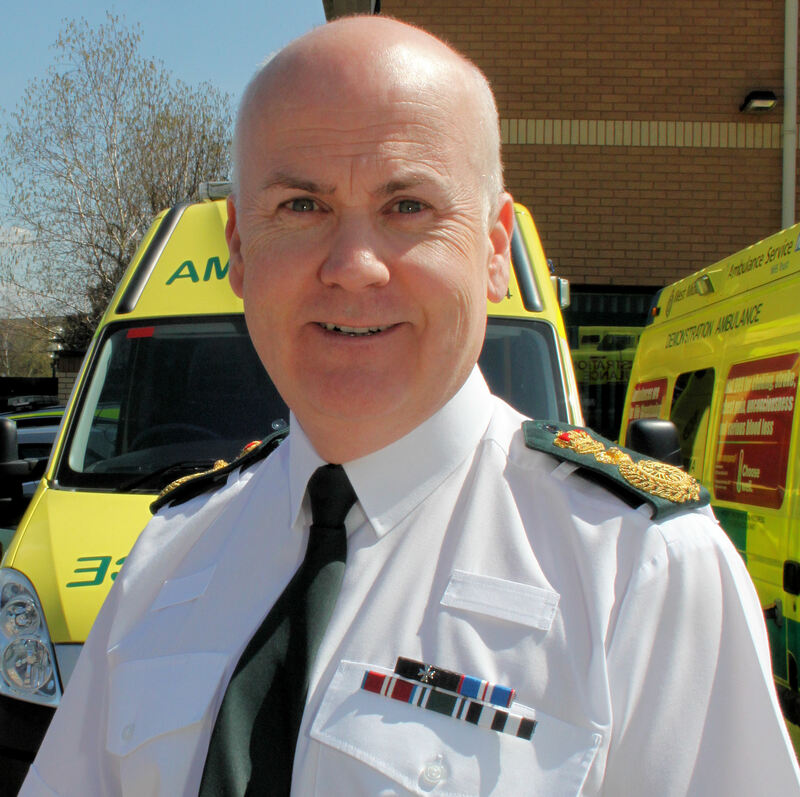 WMAS Chief Executive, Anthony Marsh, said: “In the face of mounting pressures across the NHS, this plan calls for a series of changes to support the delivery of health services. “As a Trust we have been at the forefront of making changes that have made us one of the most effective and efficient ambulance services in the country, which have led to significant improvements in patient care. “In addition, the developments have increased the number of patients being treated in the comfort of their own homes; reducing pressure on other parts of the health service. The plan highlights the need to integrate urgent and emergency care services between A&E departments, GP out-of-hours services, urgent care centres, NHS 111, and ambulance services. Since WMAS took over large parts of the 111 service in the West Midlands we have been able to bring the two services together with nurses and paramedics working side by side to help both 999 and 111 patients. The plan encourages community volunteering and highlights the role of community first responders. WMAS is lucky to already have literally hundreds of CFRs across the region and are working hard to increase the numbers. Equall,y we are heavily involved in projects such as the British Heart Foundation ‘HeartStart’ campaign which is training members of the public in basic life support. We are investing heavily in public access defibrillators which are placed in local communities so that local people and organisations can help local people and employees. The plan says the NHS will do far better at organising and simplifying the system. The Trust is determined to integrate our services with other sectors of the health service for example our close working with Birmingham and Solihull Mental Health NHS Foundation Trust and West Midlands Police to provide a massively improved service for patients who suffer mental health issues that result in either ambulance or police calls. Darker nights, where are your lights? Thursday 23rd October 2014 – 9.30am – Claire Brown. 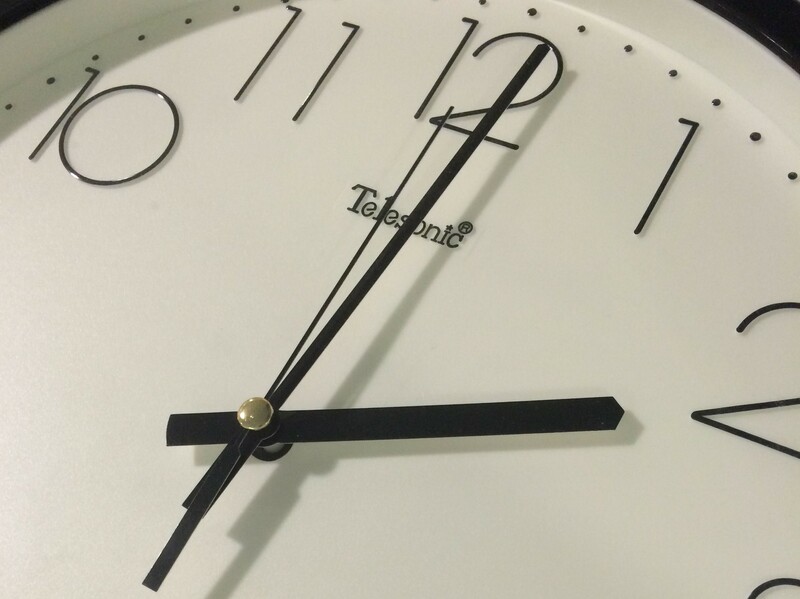 With the clocks going back this weekend, this means darker nights and more challenges for the ambulance service. Huw said: “As any motorist will tell you, in the dark it’s obviously harder to spot pedestrians, cyclists and anything that isn’t well lit. If you’re a cyclist, it’s important that your bike is fitted with clear, bright lights and that you’re wearing high visibility reflective clothing so that you are clearly visible on the road. Additionally, as an ambulance service we always advise you to wear a helmet. When a 999 call comes in, it’s vital that we can find your address quickly, day or night. Huw explains: “Whether you drive an ambulance, a police car or a fire engine, when you’re responding to a 999 call it’s really frustrating not being able to find an address. “Our crews regularly find house numbers and even road signs obscured by hedges that have overgrown over the summer or paint work that has faded. When it’s dark, it’s even more difficult to spot properties. “If we can’t see your house name or number from the roadside, we’re going to be delayed getting to you. What I need is for your house number or name to be clearly visible from the road and lit up at night to save those vital seconds which ultimately can make a significant difference to a patient’s outcome. Tuesday 21st October 2014 – 8.10pm – Steve Parry. A man has died following a road traffic collision in Coseley this morning. West Midlands Ambulance Service was called to the junction of Central Drive, Bridge Street and Martin Close at just after 11.00am. An ambulance, a paramedic officer, a paramedic in a rapid response car and the Midlands Air Ambulance from Cosford were sent to the scene. A West Midlands Ambulance Service spokesman said: “Crews attended to a collision between two vehicles, one a marked police car. “Sadly, it quickly became apparent to crews that nothing could be done to save a man involved in the incident. He was confirmed dead at the scene. Anyone with any information about the crash should contact West Midlands Police as soon as possible on 101. Monday 20th October 2014 – 7.30pm – Murray MacGregor. A woman was left trapped in the wreckage of the car she was driving for the best part of an hour after a crash in Warwickshire that damaged two other vehicles and a house. The crash happened at the junction of Warwick Road and New Road in Henley in Arden at just before 4.50pm on Monday afternoon. Two ambulances and a paramedic officer were sent to the scene. A member of staff on her way home from a shift also stopped to offer assistance. A West Midlands Ambulance Service spokesman said: “On arrival, ambulance staff found a badly damaged Fiat 500, a Volkswagen Transporter van and a small Peugeot had been involved in collision which had also damaged a house. “The woman in the Fiat, who was estimated to be in her 20’s had suffered a number of fractures to her arms and legs. “Due to her condition fire crews removed the roof to allow ambulance staff access to the woman. Because of the damage to the car, it took around 50 minutes to remove her after she had been immobilised and splints applied. “She was taken on blue lights to the Major Trauma Centre at University Hospital Coventry & Warwickshire for further assessment and treatment. “A second woman from the Peugeot had injuries consistent with the seatbelt and airbags and had possible chest fracture. She was also immobilised before being taken to Warwick Hospital. 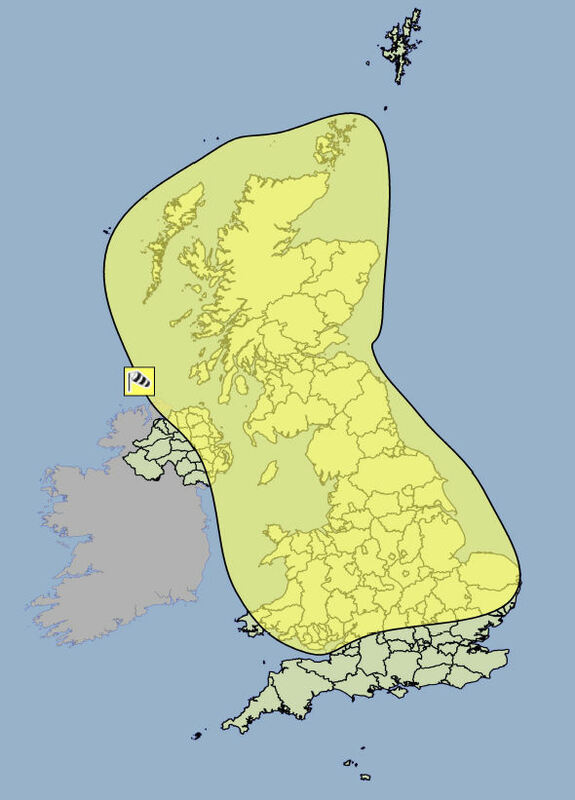 The Met Office says the strongest winds are expected to coincide with the morning rush hour in many places. Fallen leaves could impede drainage which will increase the risk of surface water affecting roads, while some damage to trees is possible, given that many are still in full leaf. Gusts exceeding 55 mph are likely in the West Midlands. The warning to the public is that we should all be aware of the potential for disruption to travel and possible damage to trees. Difficult driving conditions will result, perhaps exacerbated by surface water and spray in places. Monday 20th October 2014 – 3.50pm – Claire Brown. An elderly man whose mobility scooter collided with a lamppost in Dudley this afternoon is in a critical condition in hospital. 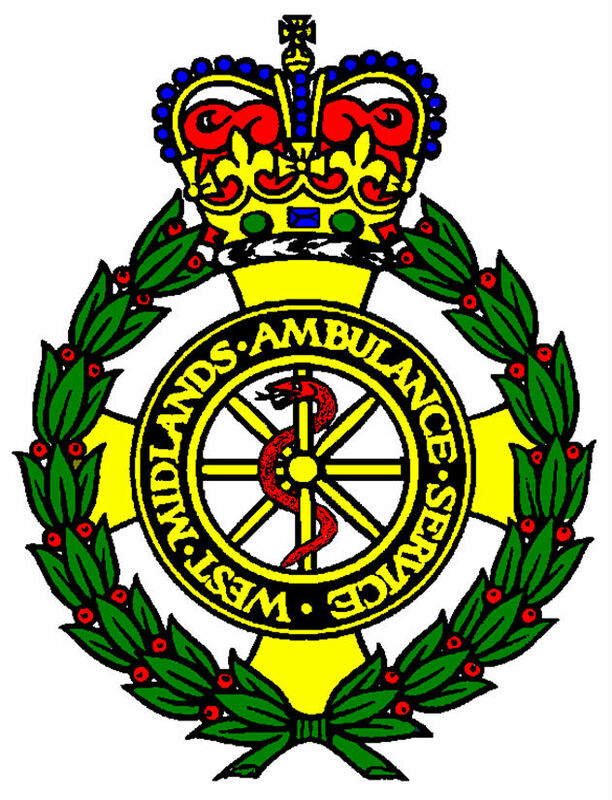 West Midlands Ambulance Service was called to Farm Road in Netherton at 1.00pm today (Monday). Two ambulances, a paramedic area support officer and a MERIT trauma doctor were sent to the scene. A West Midlands Ambulance Service spokeswoman said: “The man’s mobility scooter reportedly lost control and collided with a lamppost and concrete pillar in the incident. “The man, believed to be in his 70s, was trapped underneath the scooter for a short period. When ambulance staff and the medic arrived, the man was unconscious and upon assessment was found to have sustained a serious head injury, fractured ribs and a significant leg injury. “As a team, ambulance staff and the doctor worked to stabilise the man’s deteriorating condition at the scene by administering fluids, pain relief and a drug to reduce bleeding. The man’s seriously injured leg was placed into a splint and he was immobilised further with a neck collar and spinal board. Monday 20th October 2014 – 1.10pm – Claire Brown. 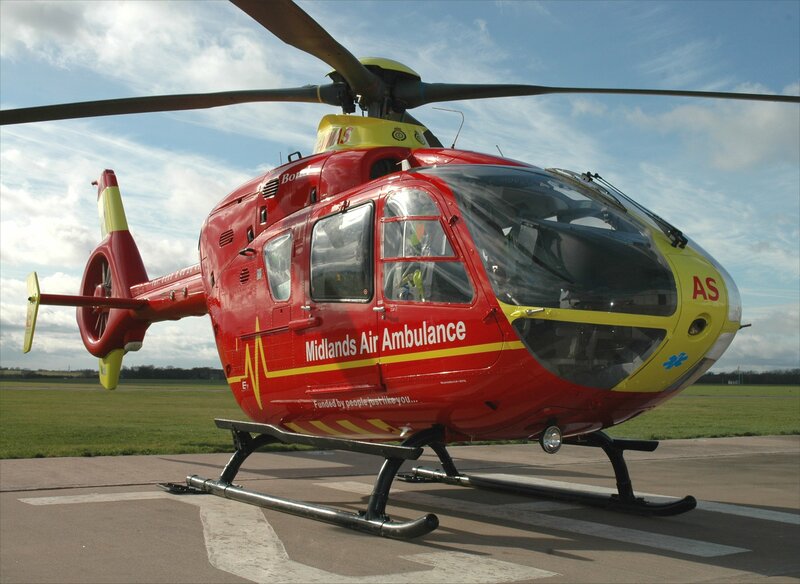 A man has been airlifted to one of the region’s major trauma centres after falling approximately 15 feet from the roof of a property near to the Shropshire / Welsh border this morning. 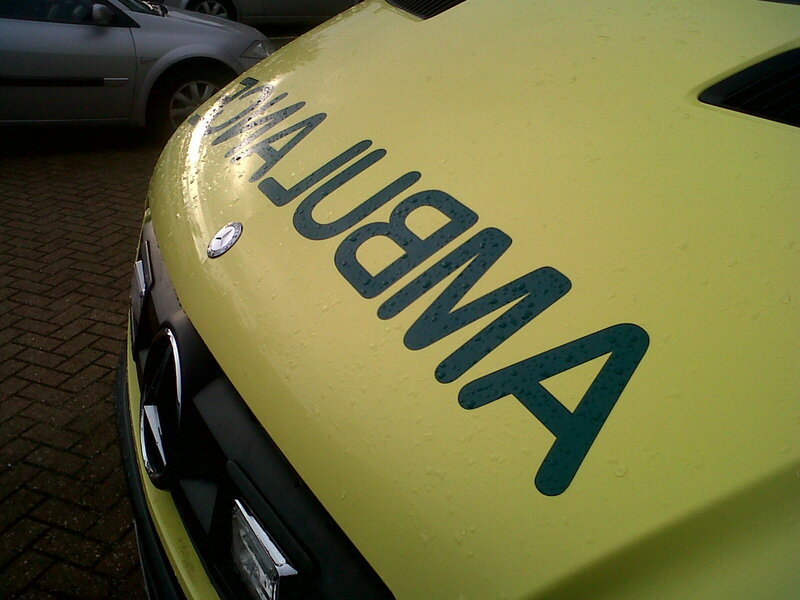 West Midlands Ambulance Service was called to a property in Winnington, Shrewsbury just before 9.00am (Monday). An ambulance and the Midlands Air Ambulance from Cosford with a MERIT trauma doctor on board attended the scene. A West Midlands Ambulance Service spokeswoman said: “The 42-year-old man had reportedly fallen, approximately 15 feet, from the roof of a two-storey property before landing onto a concrete floor. “Upon assessment, ambulance staff discovered that the man had lower back pain and was experiencing a loss of sensation and movement in both legs. Medics administered pain relief and anti-sickness drugs to the man before carefully immobilising him onto a neck collar and spinal board to prevent further movement. Sunday 19th October 2014 – 7.00pm – Claire Brown. A boy received pre-hospital care by the ambulance service pitch-side after he was injured whilst playing Rugby in Warwickshire this morning. 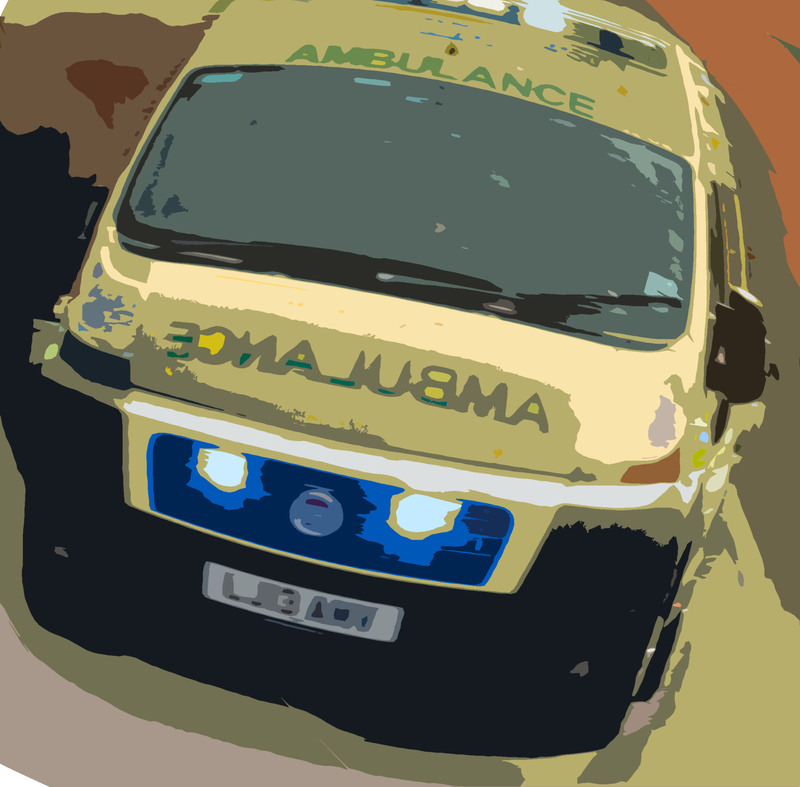 West Midlands Ambulance Service received a 999 call to Mayo Road in Shipston-on-Stour at 11.30am (Sunday). A community first responder, a community paramedic, an ambulance and the Warwickshire and Northamptonshire Air Ambulance attended the scene. A West Midlands Ambulance Service spokeswoman said: “The 11-year-old boy sustained a serious head injury during a rugby tackle. Whilst he hadn’t been knocked unconscious, ambulance crews were concerned with his disorientation following the incident. Sunday 19th October 2014 – 6.20pm – Claire Brown. A motorcyclist had to be airlifted to a major trauma centre this morning after colliding with a fellow biker in Ashbourne. The incident happened on the A515 Main Road in Draycott in the Clay, just over the Staffordshire border in Derbyshire at 10.30am this morning (Sunday). An ambulance, a community paramedic and the Midlands Air Ambulance from Tatenhill airbase attended the scene. A West Midlands Ambulance Service spokeswoman said: “Crews were told that two motorcycles had been involved in a collision. One biker, a 65-year-old man, had reportedly lost consciousness for a short time following the incident. 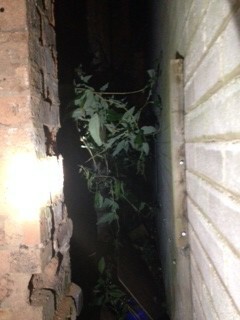 Upon assessment, crews found he had suffered a back injury. “Due to the reported unconsciousness, the man was airlifted to University Hospital North Staffordshire for further treatment. Sunday 19th October 2014 – 6.00pm – Claire Brown. 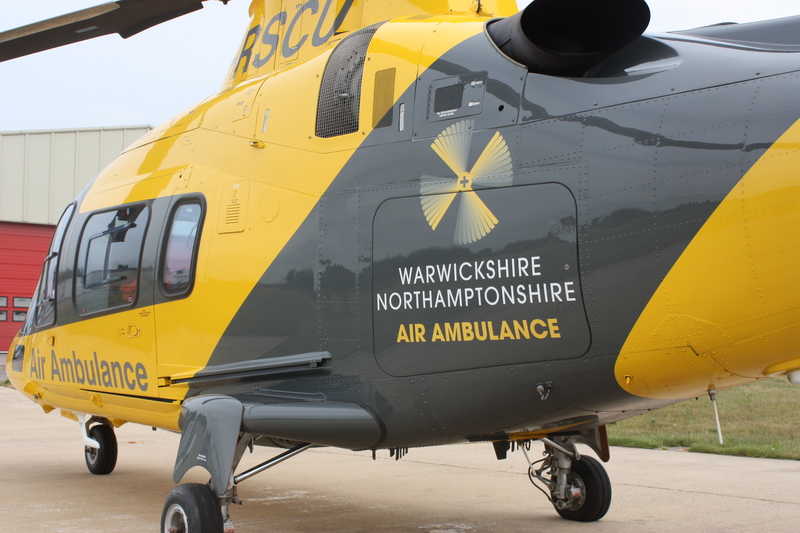 A young girl, who was kicked in the head by a horse this morning, was airlifted to a specialist children’s hospital after receiving treatment by the ambulance service in Worcestershire. West Midlands Ambulance Service was called to a property in Blackmore Park Road, Malvern Wells shortly before 7.50am this morning (Sunday). An ambulance, a responder paramedic and the Midlands Air Ambulance from Strensham attended the scene. A West Midlands Ambulance Service spokeswoman said: “The eight-year-old girl had reportedly been kicked in the head by a horse. “Upon assessment, ambulance staff found she had sustained a nasty head wound and suspected she had been knocked unconscious for a short time. Saturday 18th October 2014 – 10.45pm – Claire Brown. 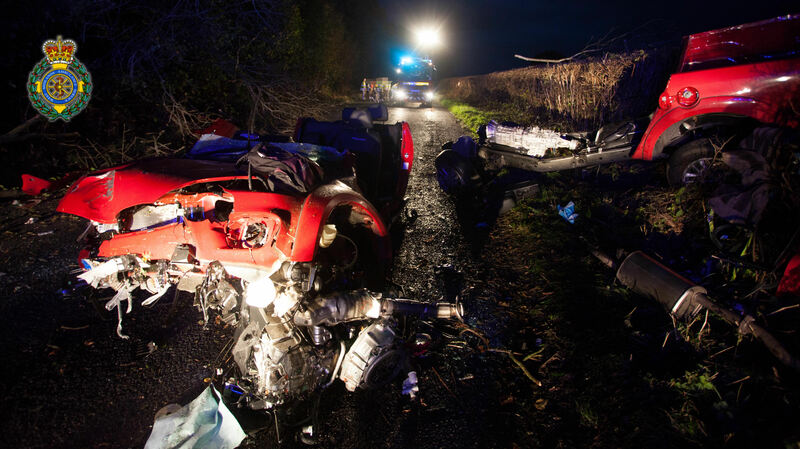 Three people have been taken to a major trauma centre after the car they were travelling in left the road and ended up in a ditch in Warwickshire this evening. The incident happened in Deppers Bridge in Southam at 7.30pm (Saturday). Three ambulances, a paramedic area support officer, a community paramedic and a senior paramedic officer attended the scene. A West Midlands Ambulance Service spokeswoman said: “The car had left the road and hit trees before rolling over and coming to rest in a ditch in a field. “A 24-year-old man suffered a suspected head injury and lacerations in the collision. An 18-year-old girl was found with chest and suspected head injuries. A 22-year-old woman suffered a hip injury and a nasty fractured arm. “The location and positioning of the car made it a difficult case for ambulance staff and fire fighter to treat the patients. Whilst ambulance staff worked to stabilise the patients’ conditions, the fire service carefully extricated them from the car. The 22-year-old woman was the last person to be released from the wreckage after around 45 minutes. Saturday 18th October 2014 – 10.30pm – Claire Brown. A woman had to be sedated on the M6 in Birmingham earlier this evening following a serious collision between a car and a HGV. West Midlands Ambulance Service received multiple 999 calls to the M6, just before junction 6 southbound, shortly before 7.00pm (Saturday). Two ambulances, a paramedic area support officer, a paramedic officer and two MERIT trauma doctors attended the scene. 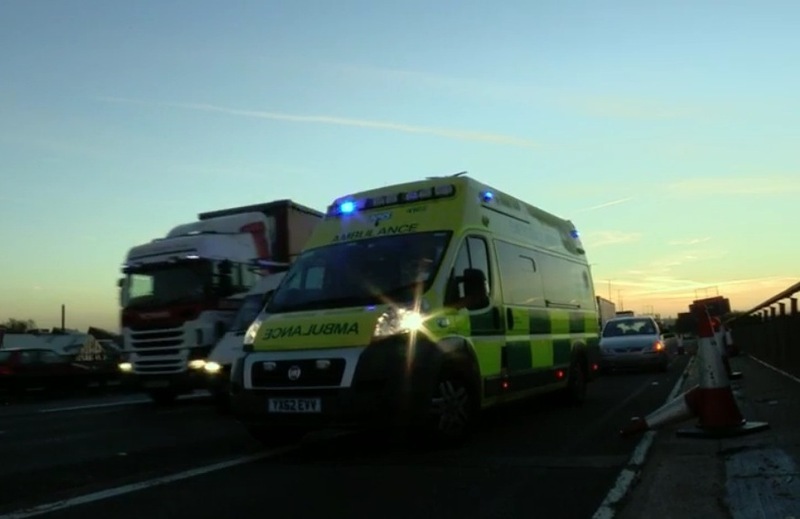 A West Midlands Ambulance Service spokeswoman said: “The collision between a car and a HGV on the southbound carriageway ended up crashing through the central reservation and onto the northbound carriageway. “The front seat passenger from the car, a woman in her 50s, had been ejected from the vehicle in the collision and had sustained a suspected head injury. Due to her condition, the medics decided to sedate her at the scene to stabilise her condition. The woman was immobilised before being taken by land ambulance on blue lights to Queen Elizabeth Hospital Birmingham. Medics travelled with the woman to hospital due to her serious condition. “The driver of the car, a man, miraculously suffered no injuries but went in the same ambulance to hospital to be with his partner. “The HGV driver, a man, was taken to Heartlands Hospital as a precaution. Saturday 18th October 2014 – 7.15pm – Claire Brown. A man who suffered a cardiac arrest at Alton Towers yesterday is alive today thanks to the quick actions of community first responders (CFRs). West Midlands Ambulance Service was called to the theme park in Alton, Stoke-on-Trent at 11.30am on Friday morning (17th October). An ambulance and a community paramedic were sent to the scene. A West Midlands Ambulance Service spokeswoman said: “The 42-year-old man collapsed and went into cardiac arrest whilst at the theme park. Thankfully for the man, CFRs from Alton Towers rushed to his aid and immediately commenced CPR. “The CFRs used the park’s automated external defibrillator (AED) and after two shocks they managed to successfully restart his heart. “When ambulance staff arrived, the man was conscious and breathing. The man was taken by land ambulance, in a stable condition, to University Hospital North Staffordshire. Saturday 18th October 2014 – 6.30am – Claire Brown. 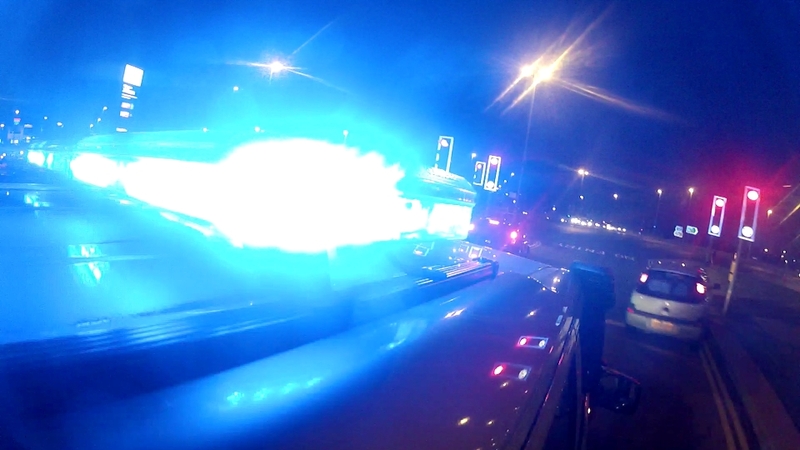 A man required extensive emergency pre-hospital care after being trapped for over an hour in his car following a collision with a road sign in Birmingham last night. West Midlands Ambulance Service was called to the A34 Birchfield Road in Perry Barr at 10.30pm yesterday evening (Friday). Two ambulances, a paramedic area support officer and a MERIT trauma doctor attended the scene. A West Midlands Ambulance Service spokeswoman said: “The single car had been involved in a significant collision with a large road sign causing extensive damage to the vehicle. “The driver and single occupant, a man in his 30s, was trapped in the wreckage sustaining a chest injury, a fractured pelvis and significant fractures to both legs. The ambulance crews and the doctor worked as a team to deliver vital pre-hospital care at the roadside to stabilise the man’s condition whilst the fire service’s technical rescue unit began the difficult process of cutting the man out of the car. “Due to the protracted entrapment and serious nature of the man’s injuries, the doctor initially requested blood to be delivered to the scene. However, once the man was released from the wreckage, after just over an hour, the blood was cancelled as the patient no longer required an emergency transfusion. Friday 17th October 2014 – 9.00pm – Claire Brown. A team of ambulance staff provided emergency treatment to five patients following a serious two car collision in Droitwich this evening. West Midlands Ambulance Service was called to the Hanbury Road shortly before 7.00pm (Friday). Five ambulances, a paramedic area support officer, two senior paramedic officers, a MERIT trauma doctor and a responder car containing the Midlands Air Ambulance crew from Strensham attended the scene. A West Midlands Ambulance Service spokeswoman said: “Crews arrived to find two cars which had been involved in a collision, both cars had sustained significant damage and three occupants were trapped. “The driver and single occupant of one car, a 51-year-old man, was trapped and upon assessment by ambulance staff he was found to have sustained a serious chest injury, a nasty leg injury and a suspected head injury. Ambulance staff worked closely with the fire service to extricate him from the badly damaged car. “Once released, the man was fully immobilised onto a spinal board and collar before being conveyed on blue lights to Queen Elizabeth Hospital Birmingham for further emergency treatment. The MERIT doctor travelled with the patient to hospital to continue treatment and monitor his condition en route. “The two rear passengers from the second car, a woman and a man, were also trapped. The 59-year-old man suffered pain in his back, chest and abdomen in the collision. He was given pain relief by ambulance staff and once extricated by the fire service the man was immobilised with a scoop stretcher and neck collar. The 51-year-old woman suffered back, neck and chest pain. She was stabilised with pain relief whilst the fire service extricated her from the wreckage before being fully immobilised. Both patients were taken by land ambulances to Worcestershire Royal Hospital. Friday 17th October 2014 – 12.45pm – Claire Brown. 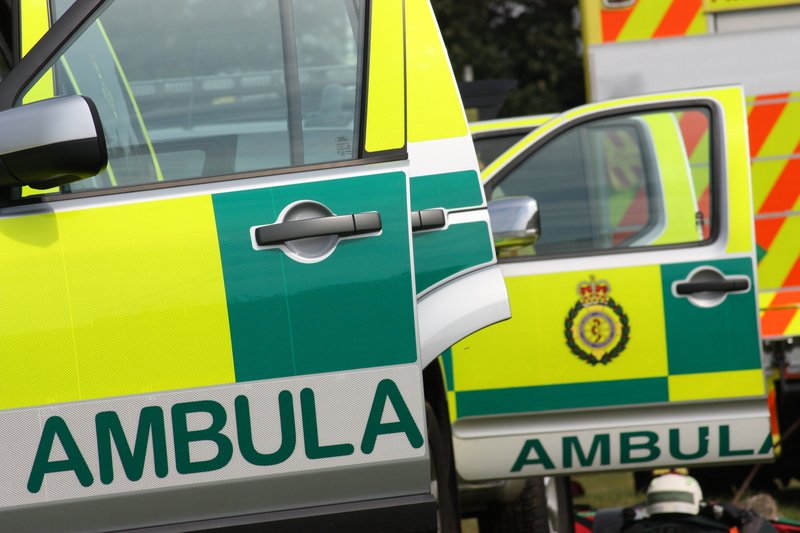 A man has died in a single car road traffic collision in Eccleshall this morning. The incident happened on the A519 between Slindon and Beech in Eccleshall at 7.15am (Friday). A paramedic area support officer and a BASICS doctor attended the scene. A West Midlands Ambulance Service spokeswoman said: “The paramedic and doctor arrived to find a car which had been in collision with a tree. Sadly it quickly became apparent that nothing could be done to save the driver, a man, and he was confirmed dead at the scene. A cyclist has been taken to hospital following a road traffic collision in Chelmsley Wood this morning. West Midlands Ambulance Service was called to Yorkminster Drive at the junction of Coleshill Heath Road at 9.30am. An ambulance responder; a paramedic officer in a rapid response vehicle together with the Warwickshire and Northants Air Ambulance attended the scene. A West Midlands Ambulance Service spokesman said: “Crews responded to a collision between a car and cyclist in Chelmsley Wood this morning. “A male in his sixties was treated for head and abdominal injuries. He was sedated by medics at the scene before being airlifted to hospital. “The patient was also immobilised using a neck collar and spinal board before being transferred to the Queen Elizabeth Hospital for further assessment and treatment.